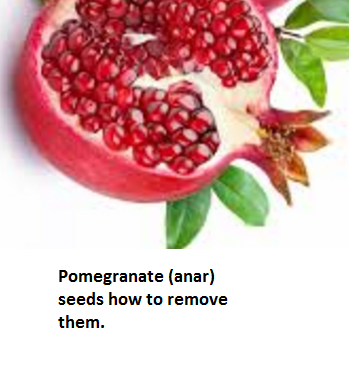 Home seeds Pomegranate (anar) seeds how to remove them. India 04 September 2016: We all love pomegranates. Me also love pomegranates (anar). I like my mother thick juice which she make at home lovely juice she remove out from the pomegranates fruit with her hands specially for me. Pomegranate juice is a healthy drinking option since Pomegranate are filled with Full of antioxidants and are best known for a variety of other health benefits. Indian culture has used pomegranates in Ayurvedic medicine for thousands of years, also they have use pomegranate juice as eye drops to help with cataracts.Pomegranates is known for its beautiful color and good taste. The Pomegranate tree Gives us a roundish fruit with a deep red coloring that has a hundreds of seeds which is surrounded by an edible pulp known as the aril. Pomegranate seeds to remove the seeds from Pomegranate its very irritating/ worst things I had done in my life but when i see it health benefits i just start to listen to music to entertain myself. Pomegranates (anar) are best, tasty and wonderful fruits because of their bright red color and intensely flavored seeds very tasty when you bite the Pomegranates seeds. Pomegranates are added in a variety of dishes. Pomegranate Arils or juice are used in cooking, baking, meal garnishes, juice blends, smoothies and alcoholic beverages such as cocktails and wine. But the Pomegranates seeds are very hard to remove mostly of its white pith that holds them in place. 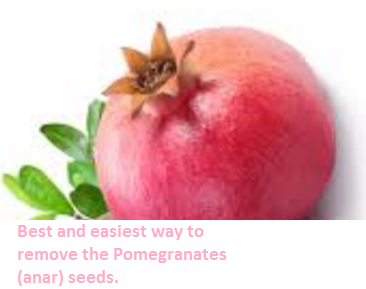 We will tell you the best and easiest way to remove the Pomegranates (anar) seeds. Take the Chefs knife / kitchen knife and cut the pomegranate into two halves. We must not drive the knife too deep into the pomegranate fruit as this will cut Pomegranates (anar) seeds and spill the Pomegranates juice and remove some nutrients that are essential for our body. 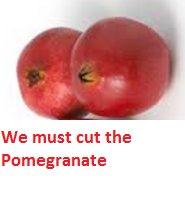 You must cut the pomegranate across it’s equator. Once you have cut / slashed the upper surface of the pomegranate with the knife rip the fruit into two halves with the use of your hands. 3) Step 1: Working over a bowl you must take a Large Wooden Spoon and hit the back of the pomegranate half several times. The seeds will fall out into the bowl. Turn the pomegranate and continue until all the seeds are removed from the pomegranate. This is the quick step but it can be a little messy. 4) Step 2: Take 1 of the halves into your hand and turn it over the large bowl. Take the Large Wooden Spoon into your other hand and strike the top of the pomegranate half with it. The Pomegranates (anar) juicy seeds with very little effort raining into the bowl. Do the same with the other half of the Pomegranates (anar) and enjoy the Pomegranates (anar) fruit at its best! Best and healthy Tip: Once they are removed or picked the Pomegranates seeds it can be refrigerated in an airtight container for atleast 3 days. Here are top best health benefits of pomegranate fruit that are important to eat this beautiful fruit. 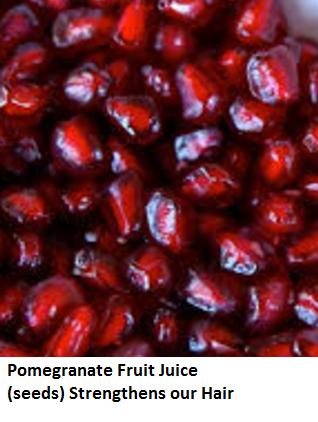 Pomegranate Juice this fruit is a great source of Vitamins A, C and E and contains folic acid. Pomegranates Juice contain antioxidants that fight against from free radicals they are the harmful cells that can become cancerous for the body. Pomegranate Juice is best and a great way for boosting the immune system. 1 pomegranate contains about 40 percent of an adult Suggested Vitamin C intake, pomegranate also has a large amount of polyphenols which are antioxidants known to fight various type of diseases.Other health benefits that this Pomegranate Fruit Juice has that it reduce the risk of heart disease, decrease the risk of Alzheimer diseases and gives us a healthy and glowing skin. The properties that a pomegranates has it keep bad cholesterol from clogging up the arteries, support a proper blood flow to the heart and When drinking pomegranate juice there is a reduction in systolic blood pressure. In toays world hair fall is the most common problem. Drinking pomegranate juice strengthens hair follicles and makes our hair thick and healthy. For your dry and frizzy hair under control we must try warm pomegranate seed oil treatment. We must apply slightly warmed up oil on our hair and must leaveit for an hour before washing and it will treat the frizz and moisturize your hair. If you are running short of time and you want to fight from your frizzy hair quickly you must try warming up a couple of drops of pomegranate seed oil between your hands and evenly spread that warm pomegranate seed oil over your unruly locks it will help remove your frizzy hair and will add a shine. Acne is caused due to digestive problems or hormonal imbalance. Hormonal imbalance causes acne and pomegranates known to cure them.Pomegranate are a rich source of vitamin C, can regulate the production of sebum its an oily substance secreted by your skin which is the main cause or root for your pimples. Drinking pomegranate juice improves your digestive system and thus promote a healthy blood circulation in the body. We should apply pomegranate juice on the areas affected by pimples. 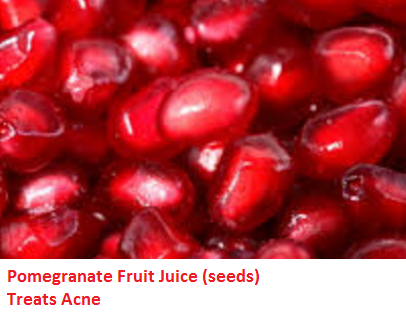 By applying pomegranate juice will prevent acne and scars by generating tissues in the affected area. Pomegranate juice can also beats green teas specially when it comes for hydrating our skin. Drinking Pomegranates juice or applying Pomegranates seed oil to your skin will fastly restore the moisture and smooth away the dryness and roughness of the skin. Pomegranate are rich in iron which helps in the transportation of oxygen. Its the oxygen that is carried to the skin to make it more radiant and younger. Dip a cotton ball into pomegranate juice and rubbed it all over your face it will works as a good toner. When you applied it this helps to lessen the spots and blemishes on the skin. Pomegranate Plays an important role in skin regeneration and remove the dead skin. 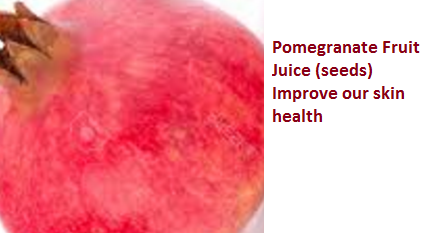 Pomegranate Juice is believe to fights wrinkles and gives the skin a healthy glow. Pomegranate seed oil is also known to speed up wound healing and prevent scars. 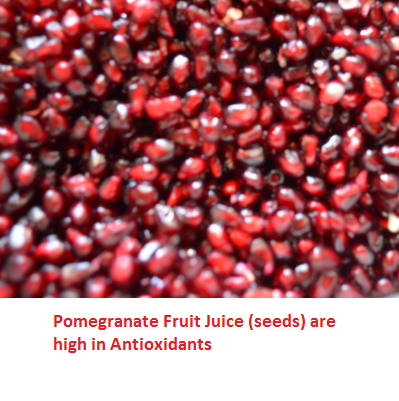 Pomegranate Fruit Juice (seeds) is one of the best and most important benefits of pomegranates. Drinking a glass of pomegranate juice everyday will increase the blood flow and thus decrease the pressure of your heart. Blood clots can be dangerous to your heart. Pomegranate reduces the clotting property in the blood. 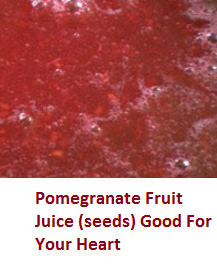 Pomegranate Fruit Juice (seeds) seeds also increase the oxygen levels in the heart.